This recipe was handed down to me by my mother-in-law. I recall her preparing this bread in soup cans to take along on family camp trips in their old FAN RV from the early ’70’s. I have no idea who thought up the idea of baking bread in soup cans but this is a fantastic idea for transporting food for a camp trip. The cans can be slightly heated over the campfire before removing and slicing the bread, or the bread can be served cold. 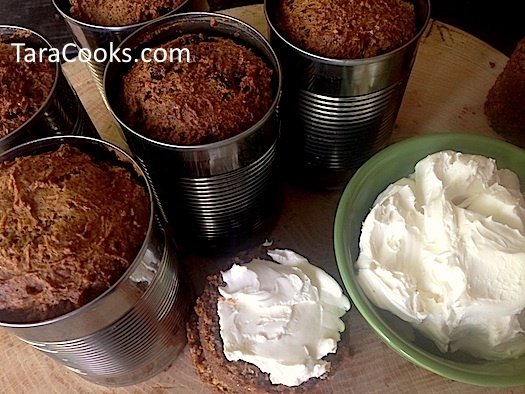 Either way, Boston Brown Bread turns out moist and filling and is perfect for camping, breakfast, party appetizer, or a snack. Serve it with some cream cheese spread or just plain butter. You will need approximately 7-8 12oz soup cans. Completely cut off the lids and remove labels and glue from the cans. The cans may then be cleaned in the dishwasher and stored for use later. In a medium sized bowl mix the cereal, raisins and buttermilk. Let mixture set for about 15-20 minutes. Then stir mixutre to blend. Sift flour with baking soda and salt, Then add the brown sugar and molasses along with the cereal/raisin/buttermilk mixture. Stir mixture to blend all the ingredients. Batter will be slightly stiff. Spray soup cans with cooking spray and then spoon some of the batter into each can, filling cans about 2/3’s full. Place all the filled cans on a baking sheet and carefully place all in a preheated 350 degree oven. Let bread bake for approximately 35-40 minutes or until bread is browned and a toothpick inserted into the middle comes out clean. Remove baking sheet with all the cans from the oven and let the cans cool completely before handling them. Run a knife along the inside of the can, between the can lining and the bread to gently loosen the bread from the can before serving. Slice loaf into 4-5 round pieces. Serve with cream cheese spread or butter. This bread can be removed from the cans, wrapped in Saran wrap and frozen for later use. Mix the cream cheese, sour cream or mayo, and nuts together. Spread over bread right before serving. Store spread in an airtight container in the refrigerator. *The original recipe did not call for the chopped walnuts in the bread batter. I like to add nuts to the bread and omit the nuts from the spread as the nuts tend to get a little soggy in the stored spread.